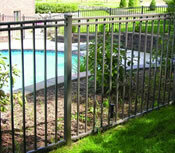 The 2-Rail Ultra Picket™ style is the ideal BOCA-code approved fence for pool enclosures. 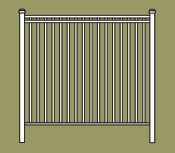 The Ultra Picket adds design excellence with exceptional rigidity. Available in Residential Series only. Standard sections are 6' wide x 4', high. Sections come fully assembled. Custom width or height sections are available.